Toothbrush Replacement: How Often Should You Change Your Toothbrush? 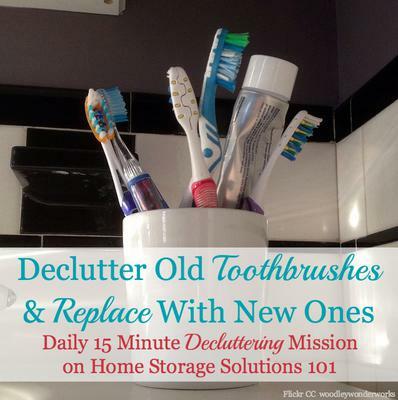 Today's decluttering mission is to declutter your family's old toothbrushes and replace them with new ones. This mission is designed to be done while working on the Makeup & Toiletries Organization Challenge on the site, which is one of the 52 Week Organized Home Challenges. 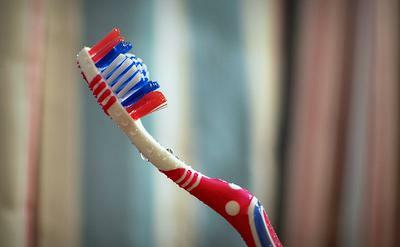 According to the American Dental Association you should change your toothbrush every three to four months, or sooner if the bristles are frayed. Therefore, although this mission will not take you much time you actually need to remember to do it more frequently than just once a year. In fact, it really should be done 3-4 times a year, at a minimum. Amy explained that she changes her family's with every change of the season. These come regularly and in just about equal intervals, so this is a great idea! Another reader, Sara does something similar, but uses the holidays for switching. She explained, "We get new toothbrushes every major holiday that involves candy. Halloween, Christmas, Easter and Independence Day. Plus we get new toothbrushes every cleaning at the dentist." 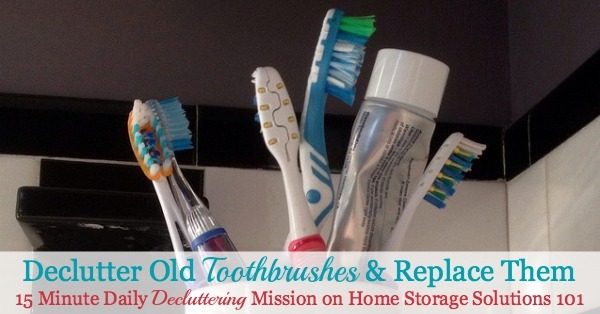 While doing this mission don't forget to also go through your other dental supplies and declutter anything that you don't use, any empty tubes or packages of floss that need to be tossed, or stuff that has gotten too old. Here's my article on expiration dates of toiletries and makeup which provides guidelines for when some of these dental supplies will become too old to use, and why this is actually important to pay attention to. Below I've also got some ideas for what you can do with your old toothbrushes instead of trashing them, and also what to do with your toothbrushes between replacements to keep them clean! Join in and write your own page! It's easy to do. How? Simply click here to return to bathroom clutter. I know a lot of you don't like to just throw stuff into the landfill when decluttering, and I totally get that. But toothbrushes don't last forever, and need to be replaced. This doesn't mean though that once they are no longer good for cleaning your teeth that they are completely useless. There are lots of cleaning uses for old toothbrushes, such as for scrubbing in small, hard to reach places, or for rubbing out stains from the laundry. 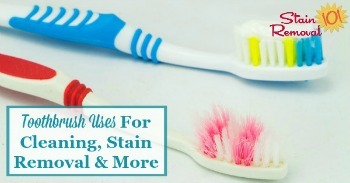 Here's a full list of uses for old toothbrushes I've collected on the Stain Removal 101 site (a sister site to this one). Make sure you somehow mark your old toothbrushes in some manner, once they've been used for cleaning tasks, so they don't get confused with the ones your family is still putting in their mouths! Further, even though the ADA suggests you can wait around three months between toothbrush replacements, I strongly urge you to at least clean your family's toothbrushes between those change outs. That's because we put these items in our mouths daily in an attempt to clean our teeth. The cleaning implement we use should itself be clean! 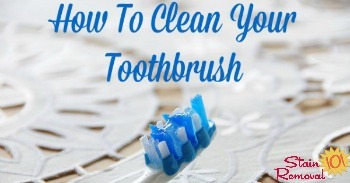 Here's instructions for how to clean your toothbrush. I hope this mission has inspired you to declutter your dental supplies in general, along with other things in your bathroom. Old toothbrushes are great for cleaning the bathroom sink around the taps gets in all those hard to reach places. every three months seems too short to me . . . I change mine every month. what about electric toothbrush replacements? What about if you use an electric toothbrush, like a Philips? How often should the detachable head be replaced? Mark old tooth brushes with nail polish so you can tell them apart from the new ones. Just be sure when saving old toothbrushes you don't save too many! I save just one or 2 to see if I will use them.